As the Dons prepare to contest the League Cup Final against Inverness Caley Thistle at Celtic Park, supporters who were around at the time of Aberdeen’s last success in that competition will recall the somewhat bizarre prize awarded to the sponsor’s man of the match on the day, midfielder Stephen Glass – the famous, or should that be infamous Coca-Cola mountain bike. 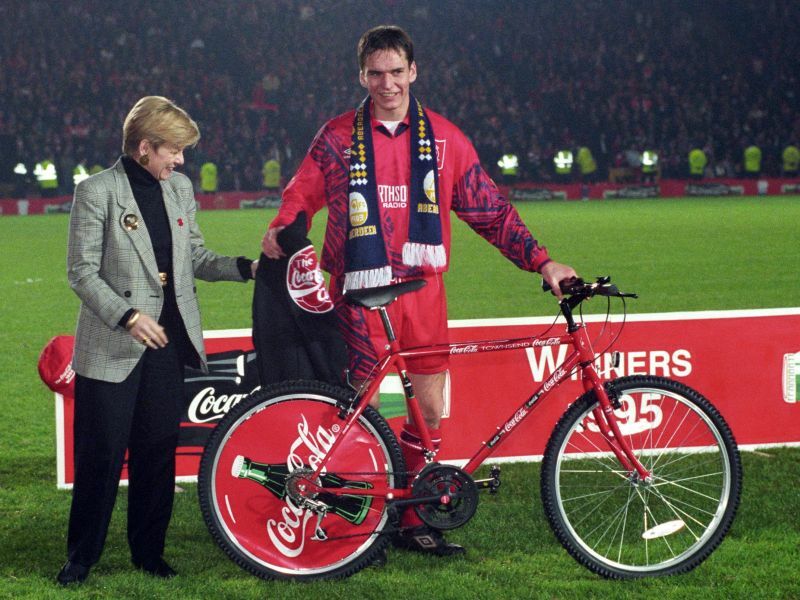 Now, almost 19 years later, the most photographed bike in the history of AFC is going to be raffled, with the proceeds going to the Pittodrie youth development. “I still get asked about the bike and what happened to it. It’s actually at my in-laws and Jack, my father-in-law, keeps it in pristine condition. Having come through the Pittodrie youth system myself, I wanted to put something back into the club, particularly as I’m now involved in that area, and donating the bike seemed the obvious choice, particularly with the impending cup final. Stephen’s father-in-law and former Pittodrie season ticket holder Jack McCombie has kept the bike at his house in Montrose since 1995. AFC Head of Youth Development Neil Simpson is confident that supporters will be eager to get their hands on such an iconic vehicle. The raffle for the unique bicycle, which is being undertaken in conjunction with the AFC Heritage Trust, will be limited to 5000 tickets at £5 each. They can be purchased via www.afcheritage.org , clicking ‘donate’ on the home page, after which a unique number will be allocated to each ‘ticket’ purchased. Alternatively, numbers can be purchased at Aberdeen Football Club. Tickets for the raffle can be purchased up until 23.59 on Thursday 13th March 2014, with the draw taking place at Pittodrie Stadium at 12 noon on Friday 14th March 2014. Details of the winner will be published on the Club website that afternoon. For info – Dave Macdermid – dave@afc.co.uk; 01224 650406; 07710 580148.